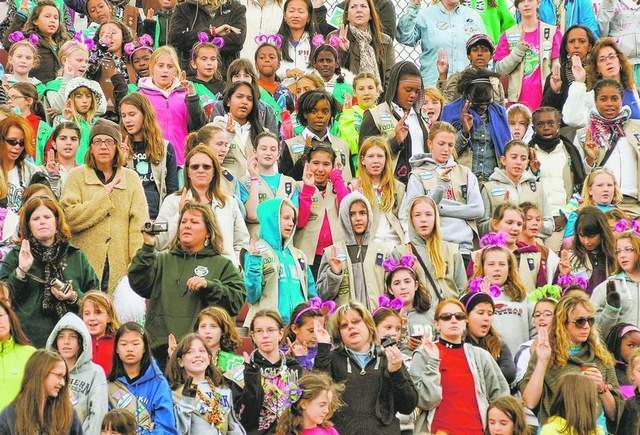 New York's Dutchess Stadium Goes Girl Scout! New York's Poughkeepsie Journal reports that Girl Scouts Heart of the Hudson is gearing up to celebrate 100 years of Girl Scouting! About 4,000 Scouts, parents and supporters of Scouting jammed Dutchess Stadium Saturday to kick off the national organization's centennial bash. Officials said Girl Scouts from Dutchess, Ulster, Orange, Putnam, Westchester, Rockland and Sullivan counties were to attend the day of songs, speeches, dance, food and fun. There was plenty of fun Saturday at the stadium, where Girl Scouts danced behind the pitcher's mound as singer Patricia Shih performed. The stands were packed and Scouts sampled ball park food, with franks, french fries and more available. The Scouts also held a canned food drive, with donations going to local food pantries. Dior Gillins, another 9-year-old from Troop 10306, said exchanging Girl Scout pins was her favorite part of the day. "I like how we get to meet here and swap pins with other troops ," Gillins said. Officials said Girl Scouts Heart of the Hudson serves 32,000 Scouts in the seven counties it covers.